We may limit ourselves to certain traditional ingredients, but there’s no need to throw up your hands in despair and cry “there’s nothing to eat!” A bit of creativity and baking expertise can help you turn out tasty desserts for every meal. This recipe contains no potato starch; a rarity for Pesach cakes! Heat the oven to 350 degrees F. Coat a 10-inch springform pan with bit of oil. Separate 5 of the eggs. Set aside the whites. In the bowl of an electric mixer fitted with the paddle attachment, beat the 5 eggs yolks with the 2 remaining whole eggs. Add 1 cup of the sugar, the cinnamon, salt, vanilla and lemon juice and mix until combined. Stir in the carrots and ground nuts. In a clean bowl and using a clean beater, beat the 5 egg whites to soft peaks. Add the remaining 2 tablespoons of sugar and continue whipping until stiff peaks form. Gently fold the whites into the carrot batter. Pour the batter into the prepared pan and bake for 50 minutes, or until a cake tester inserted at the center of the cake comes out clean. Allow to cool for at least 1 hour before removing from the pan. This recipe is very elegant and will impress all your guests. They’re tasty, pretty and simple to prepare. Peel pears, leaving stems intact, then remove core from the bottom using a melon-balling tool. Combine wine, sugar, lemon and cinnamon in a large saucepan. Bring to a boil, stirring until sugar dissolves. Add whole pears; bring to a boil; reduce heat and simmer uncovered until pears are tender, about 30 minutes. 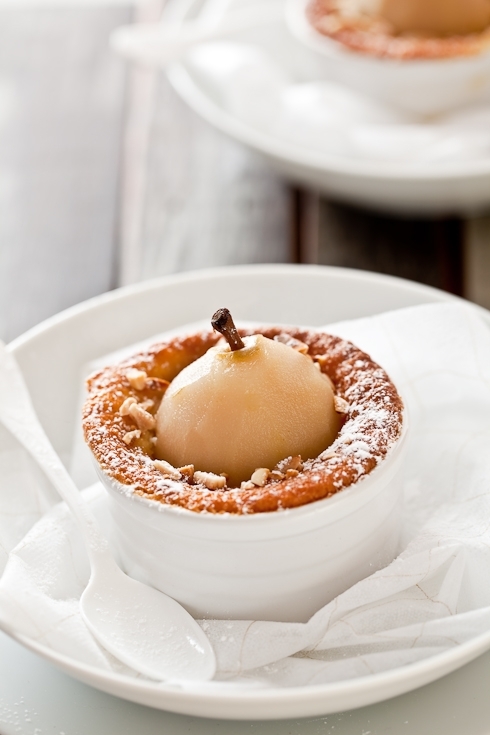 Using a slotted spoon, transfer pears to a dish. Trim the base of each pear so that it is flat and can stand upright. Continue to boil poaching liquid, uncovered, until reduced to a syrup, about 10 minutes longer. Reserve syrup. Preheat oven to 375 degrees F. Grease six 8 ounce ramekins with oil. Pulse almonds with sugar, potato starch and baking powder in a food processor until almonds are finely ground and then transfer to a bowl. Whisk in oil and honey. Stir until mixture starts to clump together. Add egg whites; whisk until well blended. Bake until cakes are just firm and pale golden with slightly darker edges, about 25 minutes. Transfer ramekins to a rack and cool 10 minutes. Brush pears with reserved syrup and serve warm.